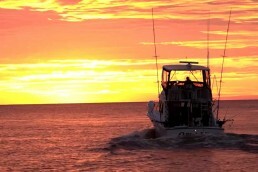 There are significant perks to being in the fishing business. 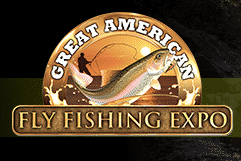 One of them is the opportunity to have customers share fishing stories and occasionally divulge details about their favorite places to fish while I’m working the sport show circuit representing Eppinger. Sometimes I’m even lucky enough to have customers invite me to their favorite fishing destinations and experience the great adventures they’ve told me about. 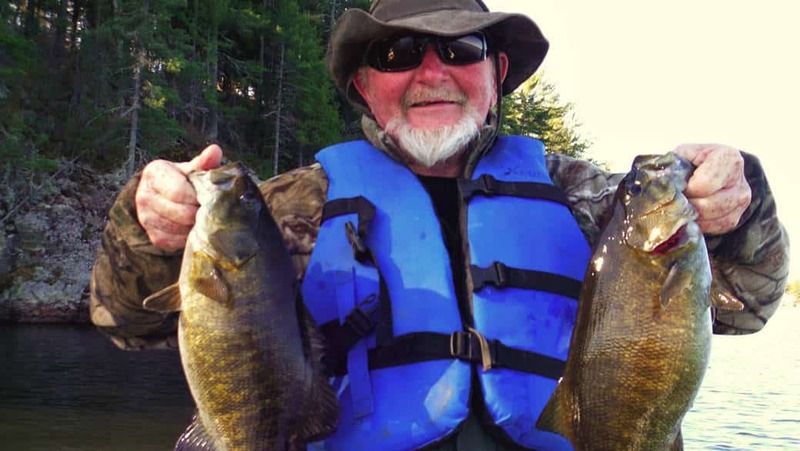 One of our regular customers, Frank Roggenbuck, has been telling us tales about the incredible spring smallmouths in the Thessalon area in Algoma Country. The Algoma region consists of over 18,000 square miles of wild Canadian Shield granite, lush forests and hundreds of glacial kettle lakes with ribbons of clear, cool streams. My friend and fishing partner Mike McGuire decided to make the trip this past spring. Thessalon is located about 50 miles east of Sault Ste. Marie, Ontario. The International Bridge is an excellent base for fishing and outdoor adventures. 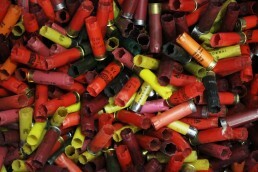 There are also motels and resorts catering to families and sportsmen. 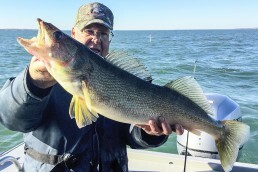 Frank has 28 years of experience fishing in Algoma Country and explained the best fishing begins when the water temperatures reach 40 degrees in spring. 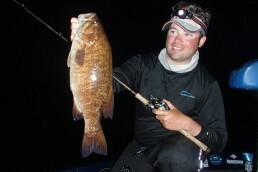 The prime range is 44 to 50 degrees for smallmouths here. 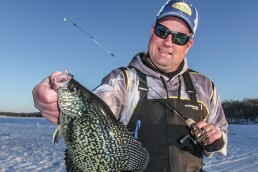 When fishing just after ice-out, there’s no need to be on the water early. 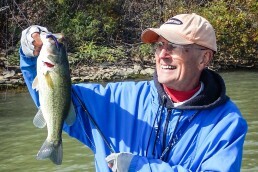 In the early spring, bass begin to move into the shallow water in the late morning, approximately 10 a.m. or so. One of his early-season strategies is to anchor off of a shallow point and watch as big, blocky shadows emerge from the deep, positioning themselves on shallow sunlit bays and reefs. Then you can do sight fishing to the marauding football-sized shadows cruising below. The fish will generally stay in the shallows until late afternoon before moving back into the deeper waters for the night. We found the best fishing was over boulder fields, rocky, submerged points and breaks near deep drop-offs. The exception was one particular bay that was full of huge, aggressive bronzebacks on our last afternoon fishing a local lake. 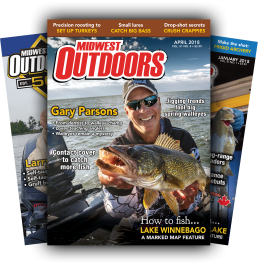 Our first day on the water was a reality check—we had expected smallmouths to be leaping into the boat like frogs after the stories we had heard. 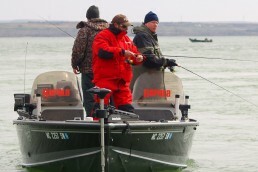 An early ice-out had changed the usual patterns of the bass for this time of year, creating a less aggressive bite. I landed my first smallmouth after three hours of pounding the water with spoons. I landed my next bass a couple hours later. We found the fishing challenging and hoped we could get some good tips from the crew back at camp. Much to our surprise, the other guys had been quite successful and caught good numbers of big bass. They discovered it took a very slow retrieve with a long pause to get the bass to commit. The take was almost always as the lure sat suspended in the water column. In the fog of enthusiasm, Mike and I had continued to fish hard and fast all day not taking time to analyze why we weren’t catching. Lesson learned. 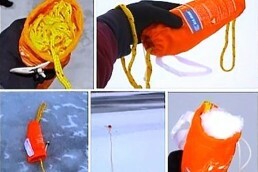 The next two days we slowed everything down and tried the retrieve pause mantra with much better results. 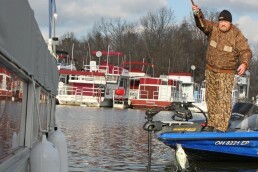 We boated 20 to 24 bass with many up to 6 pounds along with pike up to 10. 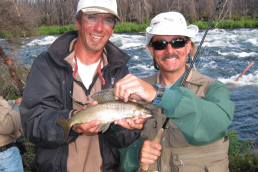 Frank’s insights were very helpful to us as this was our first time fishing this region. He suggests switching out baits every 10 to 15 minutes until you discover what the bass are seeking out as forage. It would vary throughout the day as we prospected the lake. We would usually start with smelt imitations then switch to leech, crawfish or other baitfish patterns until we found what the bass were going to hit as we worked the varied structure while slowly maneuvering parallel to shore. Many of these lakes have robust populations of smelt. These high-protein forage fish are a favorite snack for smallmouths. 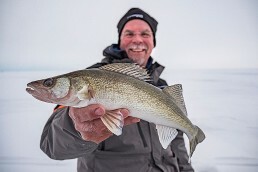 Smelt begin to spawn when the water temperatures reach 45 degrees, and the bite can be spectacular on the sandy flats where they spawn. Large Eppinger Big Ed flutter spoons in Baitfish patterns and big Silver Streamers are especially effective if you are lucky enough to hit the smelt run. The 50- to 60-fish days are not unheard of during the peak of the smelt run, according to Frank. Mike and I fished hard all morning and he landed a dozen nice bass that ranged 4 to 6 pounds using silver and blue body baits similar to the Eppinger Sparkle tail minnows. We took a break for lunch and a power nap back at our cabin and returned at 3 p.m. As it turned out, this would be my afternoon to hit the smallmouth mother lode using my fly rod. The wind was blowing out of the north at 15 mph as we navigated slowly along the points and breaks casting toward shore while retrieving with a slow, steady cadence. 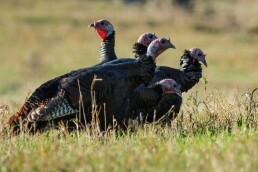 We paused often in anticipation of the thump of a big bass. As we had learned earlier, smallmouths almost always hit our lures as they sat suspended and motionless in the water column. As we rounded a long, rocky point, we came to the opening of a 10-acre bay with the wind blowing directly into its mouth, making the surface choppy and awash with foam. Windblown shorelines and bays are high-percentage targets for finding fish as the wind will blow baitfish into the bay and stir up aquatic life from the bottom. This creates a natural feeding trough, thus forming potentially high concentrations of fish. I launched a crawfish pattern into the wind and let the fly sink to the bottom. With the first strip and pause of the fly, I felt a solid “thump” as a big bass grabbed my fly and charged around the bay bulldogging while trying to shake the fly before coming to the net. I soon discovered I had hit pay dirt, as this bay was full of big hungry bass that enjoyed the crawfish. Smallmouths hit my fly like a piece of red meat for the next hour as I brought 12 to 15 fish to the boat, averaging 4 to 6 pounds with the best measuring just under 22 inches. They were exceptionally large-bodied fish with the brawny girth of a linebacker that put up spectacular battles on light tackle. At 6 p.m. the wind died down and the bite turned off. 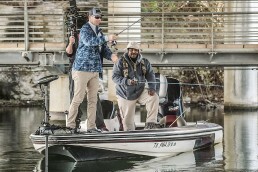 We equipped ourselves with 6 1/2-foot medium-weight spinning rods and 12-pound-test braided line. 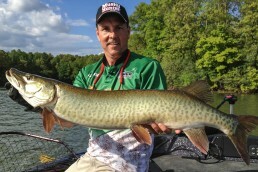 There are good quantities of northern pike in these lakes requiring the use of light wire leaders or heavy fluorocarbon bite tippets to keep lures and flies from being bitten off when ambushed by a pike. 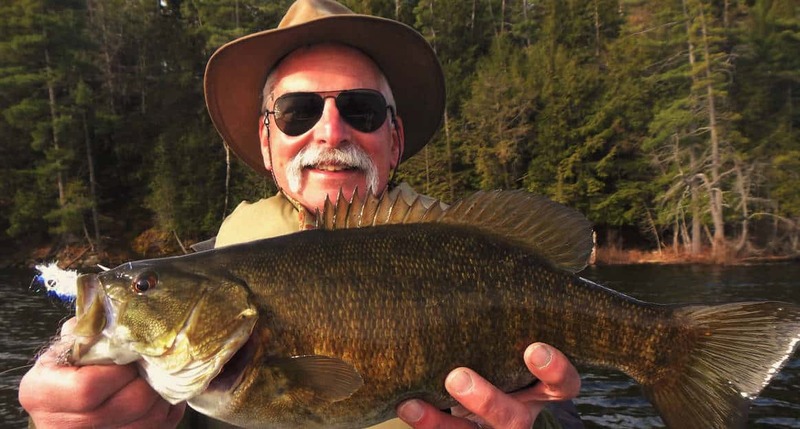 When fly fishing for large smallmouths, I recommend a 7 or 8 weight fly rod so you have control of these large fish without playing them out to exhaustion. The more weighted rod will also help with casting sink-tip lines and large leech and streamer patterns preferred by these bass in the spring. I always bring a few surface plugs for my spinning gear and poppers and mouse imitations for my fly rod. There are occasions when bass will become hyper-aggressive in spring and hit anything that moves, including surface presentations. Body baits such as the Eppinger Rattlin Devle and Sparkle Tail minnows, as well as other brands of suspending plugs and swimbaits, all have their days on the water. Spoons are very versatile in working all positions in the water column for bass including Eppinger’s Big Ed flutter spoon, 1/2-ounce Cop E Cats and 3/4-ounce Klickers. If fly fishing, bring a good selection of Clouser minnows, Deceivers, Murdich minnows, Bunny Leeches, crawfish patterns, mouse imitations and surface poppers. 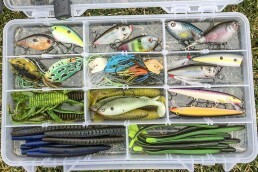 Colors should include rainbow smelt, crawfish, blue/silver, chartreuse, fire tiger, and baitfish patterns in various shades and colors such as white, silver, brown and black. 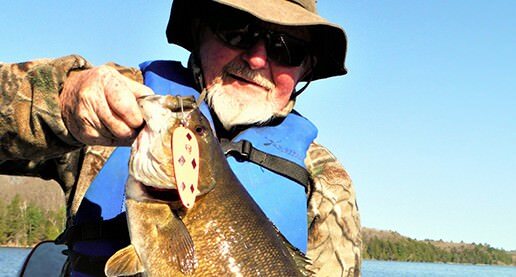 Mike and I learned a lot on our first attempt at spring smallmouths in Algoma Country. 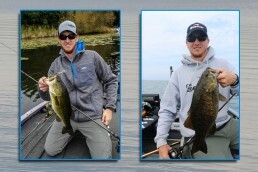 Though we had expected to catch more bass, what we did catch were some of the largest bronze beasts either of us had ever had the pleasure of encountering. 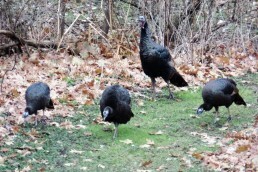 You can bet next spring we will be back in early May, prepared to play with these big bronzebacks of Algoma Country. For more information, email Algoma Tourism at info@algomacountry.com or call them at 800-263-2546. 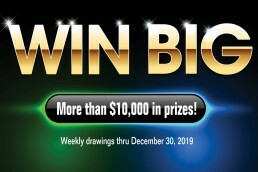 Contact Don St. Jules, owner of Birch Lake Resort, at 705-842-2219 or visit birchlakeresort.net. John Cleveland is the Marketing Director for Dardevle spoons, made by Eppinger Manufacturing Company. 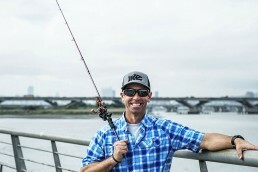 He is also an award-winning freelance outdoor writer and featured speaker on topics relating to his passion for catching big fish in wild places with fly and conventional tackle. Email: john@dardevle.com.